Uses: block paving with dry jointing sand, footpaths, pedestrian precincts, car parks etc. Watco Block Paving Stabiliser has proved to be the answer to the problems associated with stabilising the essential jointing sand and helping to protect the integrity of block paved areas. 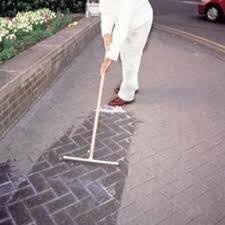 Local authorities use Watco Block Paving Stabiliser to reduce the maintenance costs associated with block paving movement. It’s even tough enough to withstand mechanical vacuum cleaning! Coverage approx. 55m² per 25 litres, allowing for one application.